Mac McCaughan was in the middle of singing a song at a record store while his wife was struggling to keep their 3-year-old son from tumbling headfirst out of her grasp. 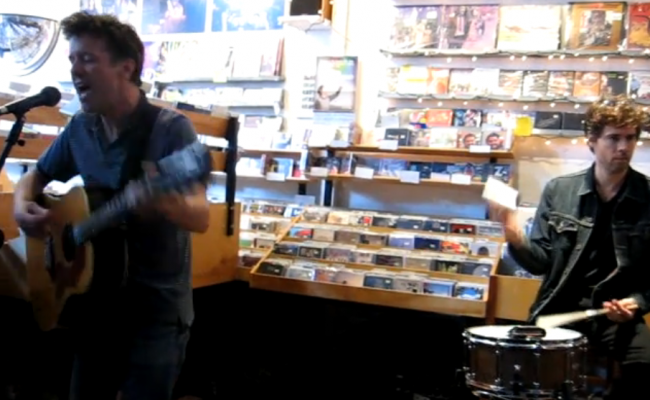 This took place yesterday, a little after 1 p.m., during an acoustic set-the sort of thing reliably advertised as “intimate”-which McCaughan was playing with two of his Superchunk bandmates, over at New York’s Other Music. (The band’s bassist, Laura Ballance, appeared to only have electric gear on this trip, and so was watching this performance from the back wall.) McCaughan’s wife and their two children (ages 3 and 7) had been either standing, hoisted or seated on the floor about two feet in front of him, along with nearly 100 semi-early risers who all waited in the deceptively strong September sun for over an hour. Superchunk’s weekend in New York was already fair to describe as a success. Just 13 hours ago, the entire band had completed a ripping, double-encore set at the sold-out Bowery Ballroom. And like their new record, “Majesty Shredding,” the whole thing was a startlingly alive sort of thing for a band this deep into-and oh, wait a second, it wasn’t time to write the story yet, because this 3-year-old, all limbs and shoes in motion, was preparing to dive from his mother’s arms and fall right on top of his sister, seated on the floor below. McCaughan had been noodling his way through a solo, his face curled skyward in that thoughtful-but-blissed-out way of playing acoustically, but then the song became McCaughan’s second order of concern, at least according to the scorecard of wrinkles right above his eyebrows. Would he ditch the tune altogether, if it looked like something really bad (and preventable) was about to happen? The situation does not play out so dramatically. McCaughan’s partner handles the kid-juggling act like a pro, guiding their 3-year-old to the floor with a practiced grace that drags his fidgeting gestures out into what looks like slo-mo speed. “I just felt bad that she was having to deal with them crawling all over her, by herself,” McCaughan said later. So, what? You like Superchunk? So do I. What else you got? Lotsa critical reaction to “Majesty Shredding” focuses on what, at first blush, appears to be the band’s reinvigorated, early 90s-sense of themselves: up-tempo and hooky — supposedly at the expense of those progressively delicate arrangements on the band’s final, pre-hiatus albums. But then Superchunk’s two full, electric sets in New York argue against a clean division between their old and less-old sounds. For instance, they show us there are a few corkers on “Indoor Living” we might have forgotten. And that a song from “Here’s to Shutting Up” can work in a stripped-down arrangement. It seems reasonable to place a reminder here that McCaughan is, along with Ballance, also co-president of Merge Records; he stops and thinks for a second. Is this a band’s fault, usually? “Exactly! When I say ‘some people’ have to think about it that way, I mean: You.” He laughed. McCaughan never uses the “shuffle” feature on his iPod. “It’s not interesting to me,” he said. One of the jobs of a record label is to create music fans? That is a charming idea! But now, it seems it is also time to talk about the Internet. On Sunday, after the acoustic in-store performance, I helpfully remind Mac that the band neglected to play “Skip Steps 1 and 3” the other night. Later on Sunday night, in Williamsburg, one man screams for “Precision Auto” right from the drop — another number that didn’t make Saturday’s setlist. And yet, the second song, much to my bliss, is “Skip.” Once it’s over, the “Precision Auto” guy screams for his favorite again. He asks for it all night. And when he finally gets it, a lot of us cheer for him and what we hope is his satisfaction. During the encore, comedian Todd Barry gets behind the drums to beat out The Misfits’ “Horror Business” with the band, while Jon Wurster takes over lead vocal duties. “Psycho ‘78!” we all sing, delighted by something we wanted that we didn’t even know about. This thing’s great! No wait: this other thing’s great! We’re all wriggly little kids, jostling and kicking with inarticulate desire, right up until the moment Superchunk sets us down on the floor and we’re all exhausted from doing the pogo. So what if it’s not a springboard for a lot of impressive, timely, well-packaged critical insights? Superchunk is playing again. Seth Colter Walls is a fan boy.